The original Garden Chapel. Total loss to arson in 1992, rebuilt and reopened in 1993. 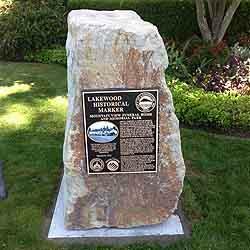 James R. Thompson, Al Gamer and George G. Williamson invested in 80 acres of land on this site for the development of a cemetery that was incorporated as Mountain View Memorial Park in 1915. J. Arthur Thompson inherited his father's stock in 1927 and later added the funeral home on the grounds in November, 1942. This was a very revolutionary idea as it was the second funeral home and cemetery combination in the United States at the time. In 1944, the Easter Sunrise Service began and continues to be a community tradition to this day. J. Arthur's son Brewer "Buck" Thompson arrived in 1956 and under his leadership Mountain View continued to grow with the addition of the Valley chapel and the Garden Mausoleum built in the 1960's. Not long after, the W. P. Daughtery Donation Land Claim was purchased adding an additional 80 acres to the memorial park. The fourth generation of the Thompson family (Brewer's daughter) Cindy Thompson started as manager at Mountain View in 1987 only to see the Garden Chapel destroyed by fire in May 1992. It was rebuilt and opened in January 1993. The Aspen Chapel, part of the Celebration of Life Center, was completed in 2000. 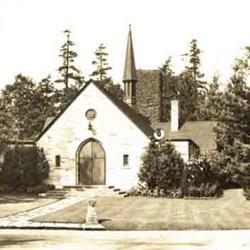 The Mount Rainier Mausoleum and Cremation Garden was constructed marking the centennial of Mountain View.